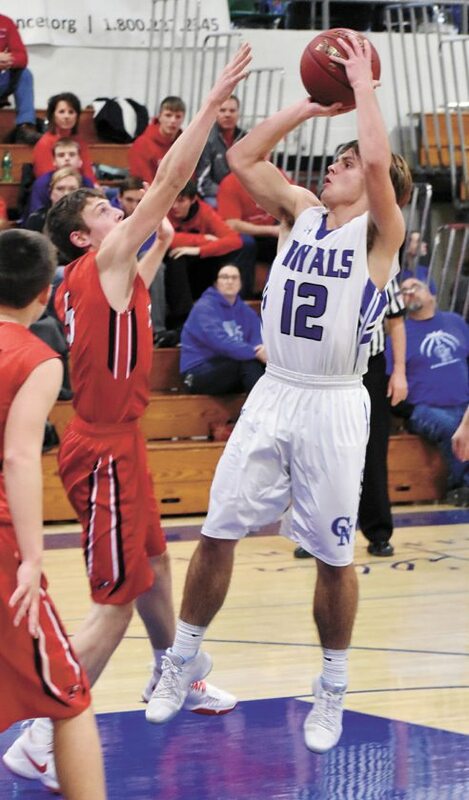 T-R PHOTO BY THORN COMPTON • Colo-NESCO senior Matthew Hill (22) sends up a shot from the block while North Tama defenders Cael Even, behind, and Cael Even attempt to contest during the first half of the Royals win over the Redhawks on Friday night. COLO — Just from the action on the court between the Colo-NESCO and North Tama boys basketball teams on Friday night, it would be hard to tell which team only had one loss in Iowa Star Conference South Division play and which team was looking for its third divisional win. The underdog Redhawks started the game off strong, taking a 10-9 lead after the first quarter, but in the end the Royals were just too much to handle, as they climbed back into the lead and held off North Tama for a 67-55 victory. 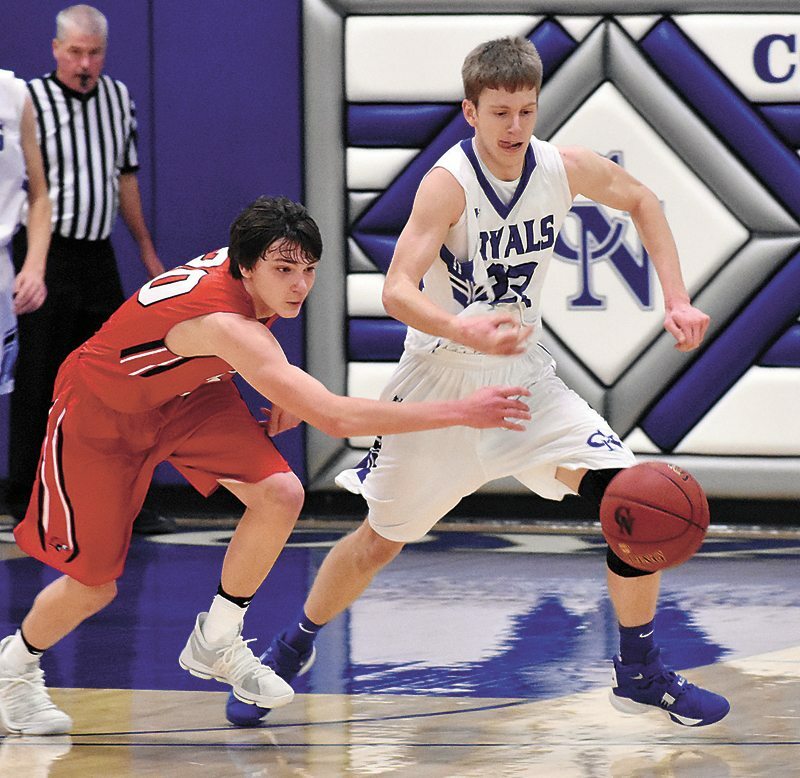 Colo-NESCO head coach Patrick Wynja said this game between his squad and the Redhawks was much different than their last meeting, a 62-43 win for the Royals in Traer on only the second night of the season. Matthew Hill was the leading scorer for Colo-NESCO (8-4, 6-1) with 21 points, the most for any player in the game, but that large point total doesn’t tell the story for how well North Tama (4-9, 2-5) held down the Royals’ leading scorer. 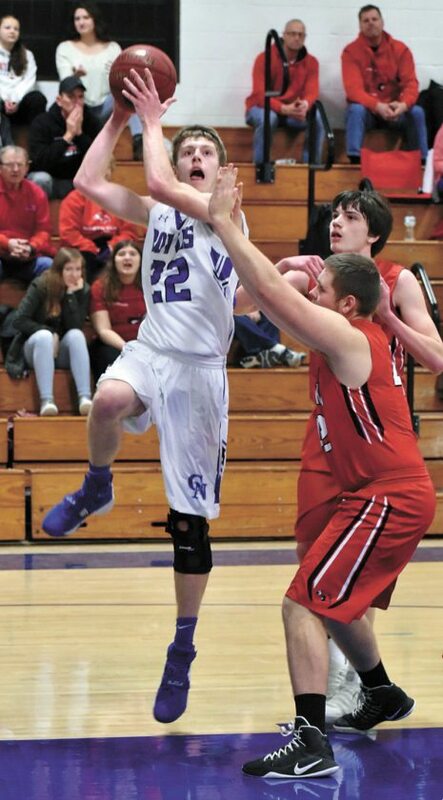 Hill only made five shots from the field, and most of his 21 came from the free-throw line, where he went 7-of-8 during the fourth quarter to help seal the win for Colo-NESCO. T-R PHOTO BY THORN COMPTON • Colo-NESCO senior Philip Bower (12) shoots a jumper over North Tama defender Hale Hulme during the Royals’ Iowa Star Conference South Division win against the Redhawks on Friday night. Two other Royals reached the double digits as well, with Philip Bower dropping in 14 points along with some key passes for assists, and Jacob Clatt scored 13, almost all of which came down in the paint. Wynja said Bower might have had the best game for anyone in a Colo-NESCO uniform, including a pass to Hill at the end of the game for a bucket that essentially ended the Redhawk rally. 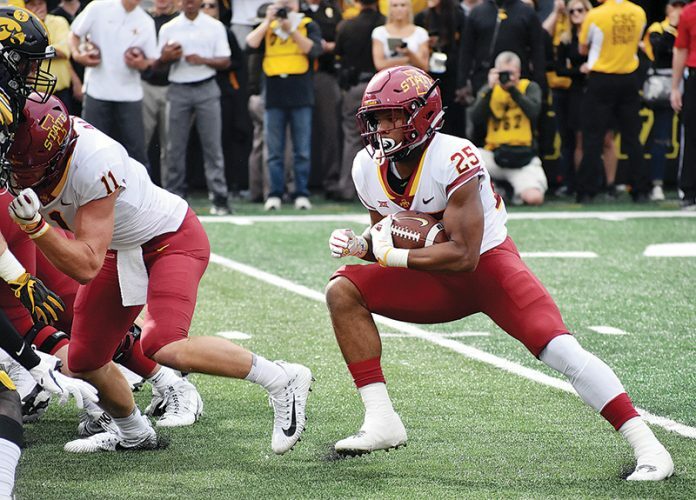 Wynja saved his highest praise for a player from the other side, however, as he said North Tama junior Noah Bond outplayed everyone on his team throughout the game. Bond was one of three Redhawk players in double figures with 16 points. Hale Hulme led the team with 19 points, including four 3-pointers, while Cael Even chipped in 11. North Tama assistant coach Mark Earley, who was filling in for head coach Alex Tagtow while he was at home with his newborn child, said when Bond, Hulme and Even are going strong, the Redhawks are tough to beat. This was an important win for the Royals as they now keep pace with Baxter for the lead in the Iowa Star South. 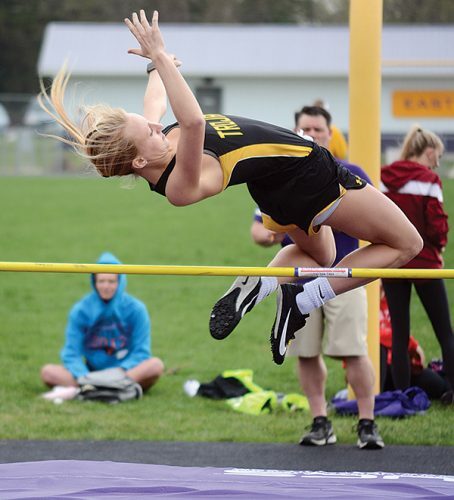 Wynja said the schedule lately has been pretty tough, and it doesn’t get any easier with Class 1A No. 2 Grand View Christian looming on Tuesday, but these tough games will do nothing but make his guys ready for postseason play. NORTH TAMA (4-9, 2-5) — Hale Hulme 5 5-9 19, Noah Bond 7 2-6 16, Lance Zobel 0 0-0 0, Nic Sierra 4 1-2 9, Cael Even 4 0-2 11, Jack Dostal 0 0-0 0, Zach Greiner 0 0-0 0, Cory Kennedy 0 0-0 0. TOTALS 20 8-19 55. 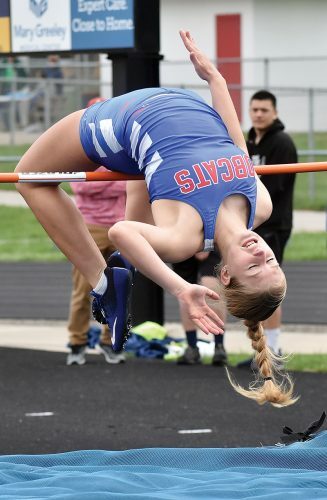 COLO-NESCO (8-4, 6-1) — Kelly Gray 1 1-2 3, Philip Bower 6 0-2 14, Sean Cutler 3 0-1 9, Matthew Hill 5 11-12 21, Jacob Clatt 6 1-1 13, Mason Lytle 0 1-2 1, Bryce Niemeyer 3 0-1 6. TOTALS 24 14-21 67. 3-Point Goals–NT 7 (Hulme 4, Even 3), C-N 5 (Cutler 3, Bower 2). Total Fouls–NT 21, C-N 18. Fouled Out–none. T-R PHOTO BY THORN COMPTON • Colo-NESCO sophomore Emma Stalzer (42) puts sends a shot toward the basket in the first half of the Royals’ big 65-24 win over North Tama on Friday night. T-R PHOTO BY THORN COMPTON • Colo-NESCO defenders Lauryn Hill (4) and Chelsea Henze, left, set a trap on North Tama guard Takoa Kopriva (25) during the Royals’ win of the Redhawks in Colo on Friday night.